The Iranian Cinema Celebration is held annually on the national Cinema Day. First, a jury reviews films long before the celebration and the selected ones are introduced during the Iranian Cinema Celebration. It has gradually become a rival event for Fajr International Film Festival, so that, prizes dispensed at both events are of the same importance to filmmakers. The celebration is also a gathering of cinema guilds with government playing the least part in its organization. During the current year, however, developments related to the 10th presidential election disrupted the annual event. Farhad Tohidi, the renowned Iranian screenwriter who was secretary of this year’s Iranian Cinema Celebration, had announced two months earlier (in late summer) that since films have been delivered belatedly and jury members are not willing to go through them, the celebration could not be held on schedule. While everybody believed that there would be no celebration during the current year, an official statement released by the House of Cinema announced that it would be held in a different way. The statement added that there would be no judgment about films and no competition and, instead, three prominent figures of the Iranian cinema will be commemorated. The figures included Nasser Taqvai, Nikou Kheradmand, and Digran Toomanian. 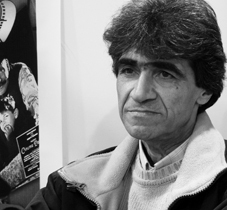 Taqvai is experienced writer and director of the Iranian cinema with Tranquility in the Presence of Others (1969), Dear Uncle Napoleon (1974) and Captain Khorshid (1986) on his track record. He made his last film about one decade ago. Nikou Kheradmand is actress, dubbing artists and famous presenter of the Iranian radio with more than 50 years of experience. She had won a prize as best actress from Fajr International Film Festival for her role in Varouzh Karim Massihi’s The Last Act (1989). She passed away two months after she received a plaque of honor in the cinema celebration. Toomanian is an Iranian Armenian and among the most experienced laboratory experts. In another part of the celebration, Tehran Municipality Mohammad Baqer Qalibaf was lauded for his attention to cinema and construction of multiplexes. A number of filmmakers had taken part in a video clip to thank the mayor. The celebration was held at the conference hall of Esteqlal Hotel (former Hilton Hotel which is one of the oldest hotels in Tehran and usually hosts international guests) and was attended by the 10th government’s minister of culture and Islamic guidance and a group of filmmakers.